Decorative Life: About 5-10 days. Member of the Oleaceae (olive family). Native to Europe, Central Asia. Common relatives include forsythia, jasmine, osmanthus and olive. Has small star-shaped flowers in pyramid-shaped clusters (6-10 inches long) at stem ends. Stems are woody, up to 24 inches. Plant is a deciduous shrub or small tree, classed as a dicotyledon. 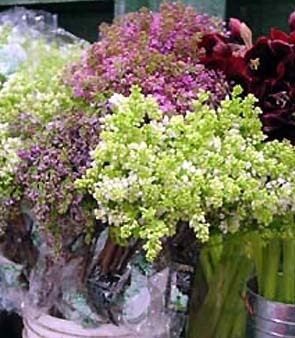 Flowers have a sweet, mild and very characteristic fragrance. At 36-39F for up to 7 days in water. From the Greek “syrinx” (a pipe) referring to the stems which are hollow. Even the common name lilac is from the Persian “nilak” (blue). The specific epithet name “vulgaris” means common. Commonly grown as a landscape plant. The American Academy of Allergy, Asthma and Immunology lists this species as an allergy-safe pollen producing plant. According to Creasy (1999), fresh petals are edible. Can be used in cheeses and frozen yogurt and as a garnish with sweet dishes such as cakes. The sap of fresh-cut lilac branches is said to reduce vaselife of other flowers so let them stand in water alone for a time before combining with other flowers. Immersion of the stem ends in boiling water for a few seconds is said to facilitate water uptake.